Violinist Hae-Jin Kim received her Bachelor’s and Master’s Degree from the Eastman School of Music where she was awarded a prestigious Performer’s Certificate and the Starling Foundation Award. As a chamber musician, she has appeared in numerous performances including Free Marz String Trio of March Music Moderne, NW New Music, Artesan String Quartet, Asiana String Quartet and Pacifica Trio. Hae-Jin has appeared in the Kent Bloosom Music, the Music Academy of the West, the Astoria Music Festival, the Portland Summerfest Opera, the Oregon Music Festival, and The Bridgetown Orchestra (including appearance at TED X Portland 2016). She is an Assistant Concertmaster of the Oregon Ballet Theatre Orchestra and a member of the Portland Opera Orchestra, and plays with the Oregon Symphony Orchestra. She has a private teaching studio in NW Portland and a faculty member of the Chamber Music Camp of Portland. JOY FABOS, violin, resides in Portland, Oregon. She completed her studies at Northwestern University. She has played with many orchestras in Portland and the Northwest as a freelance violinist- including the Spokane Symphony, the Portland Chamber Orchestra, the Honolulu Symphony, the Vancouver Symphony, and the Sunriver Music Festival Orchestra. . Joy spent two years in Thunder Bay, Ontario as a member of the Thunder Bay Symphony Orchestra and returned home to Portland where she earned a position with the Bach Cantata Orchestra and became a founding member of the string quartet Arcadia PDX, now Wildwood. She has also enjoyed playing and recording with Pink Martini and Storm Large. Angelika Furtwangler, viola, holds a Doctor of Musical Arts degree from the University of Wisconsin and has lived and worked in the Portland/Vancouver area for the last 10 years. She performs regularly with Portland Opera Orchestra, Oregon Ballet Theatre (Principal Viola), Vancouver Symphony (principal viola) and WildWood String Quartet. She has also performed frequently with the Detroit Symphony, Portland Chamber Orchestra, Portland Summerfest Opera Orchestra and Astoria Music Festival. 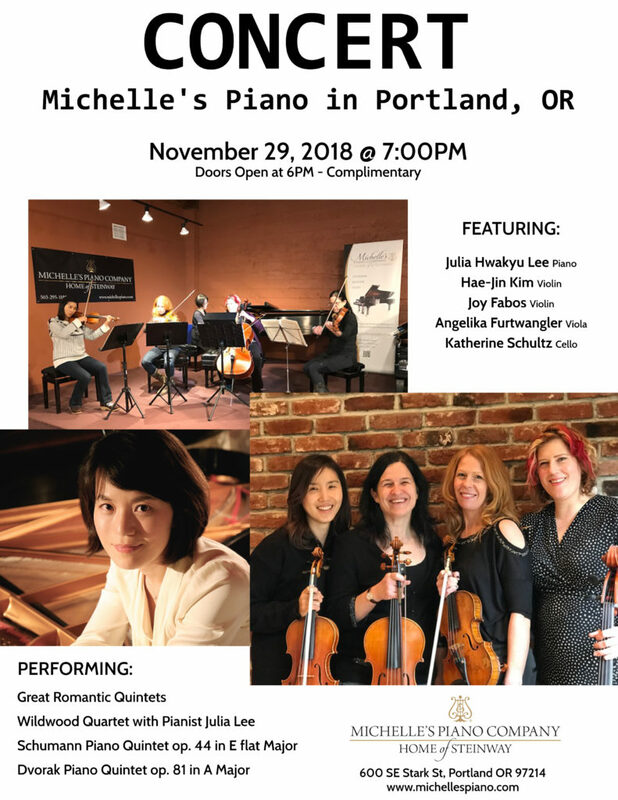 She has a private music studio filled with violin and viola students and teaches strings at Lake Oswego Schools and Oregon Episcopal School in SW Portland. Angelika earned her Bachelor of Music degree from Munich Musikhochschule and a Master of Music degree from the Cincinnati Conservatory of Music. Katherine Schultz, cello, is currently the principal cellist of the Portland Chamber Orchestra, assistant principal of the Oregon Ballet Theatre Orchestra, and a member of the Portland Opera Orchestra. In the past she has served as assistant principal of the Tacoma Symphony and played with the Houston Symphony and the Civic Orchestra of Chicago. Katherine is an avid chamber musician. In addition to performing with the WildWood and Delphinium string quartets she has been a featured artist in many chamber music series throughout the Pacific Northwest, including the Siletz Bay Music Festival where she has fulfilled the role of soloist, chamber musician, and principal cellist since 2009. Other festivals in which she has participated include Sunriver, Oregon Coast, Cascade, Tanglewood, Kent/Blossom, National Orchestral Institute, and Interlochen. Katherine maintains a private cello studio, is a faculty member at Concordia University, and teaches cello and chamber music at Portland’s Community Music Center. Her students are members of PYP and MYS and have won prizes at the OMEA and Oregon Cello Society competitions. Katherine began playing violin at age 3, and switched to cello at age 14. She holds a Bachelor of Music degree from Northwestern University and a Master of Music degree from Rice University’s Shepherd School of Music. Primary teachers include Hans Jorgen Jensen and Norman Fischer. Katherine has performed under the baton of such noted conductors as Seiji Ozawa, Hans Graf, Christoph Eschenbach, James Conlon, Pierre Boulez, Pinchas Zuckermann, and Robert Spano. Chamber music coaches include Norman Fischer, Brian Connolly, Pamela Frank, Joella Jones, and members of the Vermeer, Juilliard, Pacifica, and Miami Quartets. Julia Hwakyu Lee, pianist, has performed solo and chamber music in New York, San Francisco, Las Vegas, Portland, Toronto and cities in Korea including Seoul. Dr. Lee is on the faculties of the University of Portland and Portland State University. Previously, she served on faculty at Southern Utah University and at the University of Wisconsin-Madison. Dr.Lee’s many prizes and awards include the Chamber winner in Niagara International Music Competition in Canada, Gold Medal in Hankuk Ilbo Competition in Korea, Beethoven competition in Wisconsin- Madison, and fellowship recipient in Gilmore Keyboard Festival in Michigan. Julia Lee has been a soloist with University of Wisconsin Symphony Orchestra, Korean Chamber Orchestra, Portland’s Columbia Symphony, University of Portland Orchestra and Ulsan Chamber Orchestra. She presented lecture recitals at the College Music Society national conference and regional conference. As an active adjudicator, she adjudicated NW Chopin competition and Simon-Fiset competition in Seattle, WA., including festivals in Portland and Salem, OR. She has participated in master classes with Leon Fleisher, Richard Goode, Claude Frank, Paul Badura-Skoda, Gary Graffman, Rusell Sherman and John O’Conor. Her students succeeded in many competitions including 1st place in Music Teachers National Association (MTNA)’s state competition in 2010, 2nd place in MTNA’s National competition in 2009, 1st place in Oregon Music Educators Association (OMEA)’s Solo & Ensemble competition in 2008, 2009, Presidential Scholar in the Arts in 2004, and numerous students won soloist competitions and performed with the orchestras in Wisconsin, Illinois, Washington and Oregon. Dr. Lee received her Doctor in Musical Arts in Piano Performance from the University of Wisconsin, Master in Music from Korean National University of Arts, and Bachelor in Music from Yonsei University, Seoul.